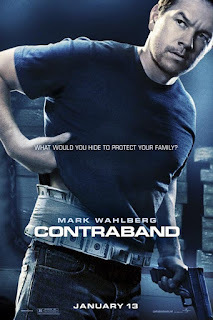 Reality by Rach : 'Marky Mark' is STILL a Badass: Contraband Movie Review! 'Marky Mark' is STILL a Badass: Contraband Movie Review! So I ended up seeing the new Mark Wahlberg flick Contraband last weekend for my birthday and I must it delivered me an action packed birthday gift in a neat little bow! In the harsh months of Winter, not only are the trees bare but so are our movie selections. So with this or Beauty and the Beast 3D as my options and already having the little kid in me brought out by watched The Lion King on Blu-ray the previous day, Contraband it was. The film started off with some grainy footage of Wahlberg, Kate Beckingsale and Ben Foster at a friends' wedding where we get some back story on the trio. Beckingsale and Whalberg married and have been friends with Foster's for years and have all turned their not so respectable lives' around. Unfortunately Beckinsale's brother, played by Caleb Landry Jones from X-Men First Class doesn't live by the same moral codes. He ends up getting into some serious trouble with some local gang bangers, lead by Giavanni Rabisi. Wahlberg's character steps in to help his wife's little brother and let the drama begin! Filmed on location in New Orleans the backdrop to the story in gritty and and works well with the film's numerous grainy and dar scenes. For a decent part of the movie taking place a huge cargo ship it's actually pretty damn exciting. I seriously felt my head spinning with one action scene after the other which really helped the film move along a quick pace (which was nice since it has a run time of 2hrs and 50 minutes)! Contraband takes a lot of twist and turns that you really don't expect, especially when it comes to the ending but all in all it's your typical action flick. I most certainly had a clear picture of what the conclusion of this film would be and was certainly delivered something quite unexpected. I thought the performances were good and give 'Marky Mark' credit for being able to draw an audience after and making the film number 1 it's opening weekend! I give this film a solid B and really recommend it for something to do to rid yourself of those Winter blues.